The Gentleman Crafter: The Crafty Scrapper This Weekend! The Crafty Scrapper This Weekend! A big weekend is at hand and I'm off today to tackle it! Yahooo! 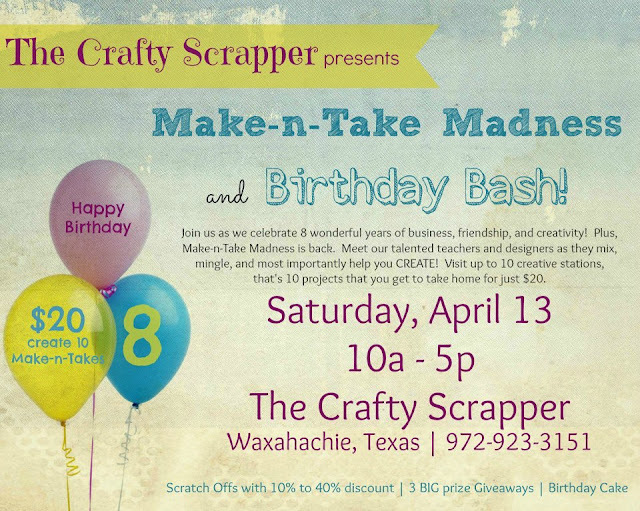 If you are around Waxahachie, Texas tomorrow, come on over to the Crafty Scrapper for the Birthday Bash! I'll be doing a little gift card holder that is fast and fun to make! Jim, have a fantastic time! Happy Friday. Yahoo! OOOOO Have some Fun Fun FUN for me!!!!! I'll be there :) and bringing 3 friends too! Should be a ton of fun, can't wait! They are so lucky to have you Jim, wish I could be there! Have a great time. "I wish I was there, I wish I was there, I wish I was there" (clicks heels on ruby slippers - but nothing happens)! Hope you have a fun time! I'll be there and bringing my SIL with. I'm getting her hooked on papercrafting. I hope you had a fabulous and fun day!!! Can't wait to hear all about it!!! You Can Follow My Blog Here! Thank You For Following! You Rock! I'm a RANGER GRAD! Yahooo! Journal Fun and Ranger U! Thank Yous, Gifts and Courtyard! My Day At The Crafty Scrapper! A New Vintage Book From An Antique Inspiration! Ustream At 7 p.m. Central! Graphic 45 - Want2Scrap - Art Glitter Blog Hop Today! Spring Is In The Air! This Month's New Spring/Garden Inspired Projects! All pages, images and text copyright of Jim R. Hankins, The Gentleman Crafter 2012. Picture Window theme. Powered by Blogger.